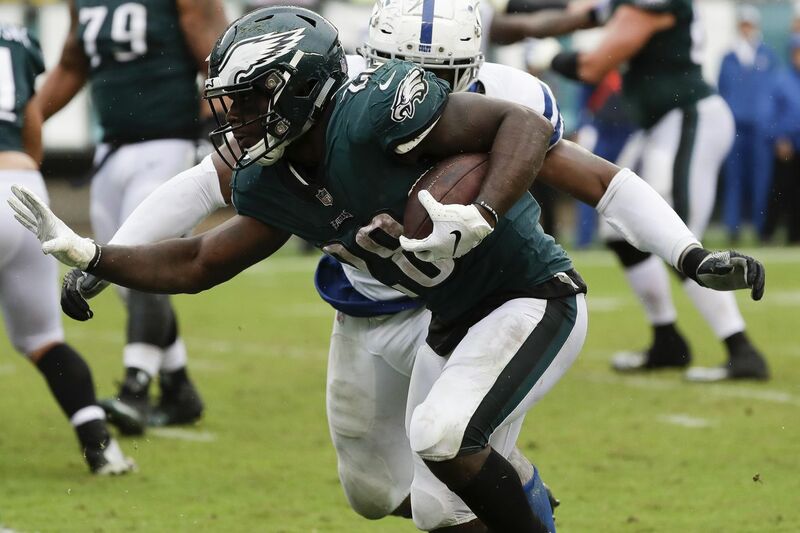 Wendell Smallwood runs with the football against Indianapolis. But that was the last time the Colts reached the end zone. Their other four red-zone trips, two of which came off Carson Wentz turnovers, resulted in just nine points, on three Adam Vinatieri field goals. They drove to the Philadelphia 4-yard line late in the game, but Darby forced an incompletion on a third-and-3 pass in the corner of the end zone to Colts wide receiver T.Y. Hilton, and then defensive end Derek Barnett beat left tackle Le'Raven Clark, who was subbing for injured Anthony Castonzo, and sacked Luck on fourth down. Except for the two turnovers — a third-quarter interception by Colts linebacker Anthony Walker on a pass to tight end Zach Ertz that gave the Colts the ball at the Philadelphia 17, and a third-quarter fumble on a strip-sack by Margus Hunt late in the same quarter that gave the Colts the ball at the 13 — Wentz played very well in his first game back from knee surgery. He completed 25 of 37 passes for 255 yards and engineered two impressive touchdown drives. The Eagles controlled the ball for nearly 40 ½ minutes Sunday. Sixteen-and-a-half of those minutes came on the Eagles' two scoring drives. The first, on the Eagles' first possession of the game, was a 12-play, 79-yard drive. With a depleted wide-receiving corps, Doug Pederson used three-tight-end sets almost exclusively on the drive. Wentz completed five of seven passes for 55 yards. All five completions were to his tight ends, including three to Zach Ertz, and a 13-yard touchdown pass to a wide-open Dallas Goedert. The Eagles had just one third down on the drive. Wentz converted that with a 7-yard pass to Ertz on a quick out route. The game-winning second drive came after the Colts went up, 16-13, on Vinatieri's third field goal. The Eagles went on a 17-play, 75-yard, 11:18 march that ended with Wendell Smallwood going in from 4 yards to put the Eagles ahead with 3:02 left in the game. Wentz completed all eight of his pass attempts in the drive, including two critical third-down passes to wide receiver Nelson Agholor. The Eagles also were aided by a defensive holding penalty on Colts end Jabaal Sheard on a fourth-and-5 incompletion to wide receiver Jordan Matthews. Sheard used his left hand to hold Eagles right tackle Lane Johnson, which enabled teammate Margus Hunt to run a stunt to the outside. It was Hunt's pressure that forced the incompletion. The Colts converted just two of 12 third-down opportunities. They failed to convert a single one on their last seven possessions. Luck was 4-for-11 for 10 yards on third down with one passing first down. The defense's ability to get off the field on third down was a strength last season and is again this year. Through three games, the Eagles are second in the league in third-down defense. Opponents have converted just 27 percent of their third downs. Eagles defensive end Fletcher Cox and defensive end Chris Long raise their arms during the game against the Colts. The Eagles kept the Colts out of third-and-manageable situations much of the game. Just four of the Colts' 12 third-down situations were 6 yards or less, and just two were 4 yards or less. Cornerback Jalen Mills broke up an end-zone pass to tight end Eric Ebron on a third-and-6 play at the Eagles' 14-yard line that forced the Colts to settle for a Vinatieri field goal. Linebacker Nigel Bradham stopped running back Jordan Wilkins for no gain on a third-and-7 red-zone pass early in the fourth quarter that forced another Vinatieri field goal. And Darby forced an end-zone incompletion to Hilton on a third-and-3 in the red zone that immediately preceded Barnett's fourth-and-3 sack. Ajayi and Sproles both were on the shelf. Again. That left Corey Clement, Wendell Smallwood and undrafted rookie Josh Adams, who had just been signed off the team's practice squad. The Colts' defense had muzzled the Redskins' ground game – just 65 yards on 22 carries – a week earlier. So, the Eagles' chances of having much success on the ground Sunday, beyond possibly a couple of Wentz scrambles, didn't appear to be to be too good. But the Eagles offensive line, helped by the plethora of two- and three-tight-end sets, came up with its best run-blocking performance of the young season as Clement, Smallwood, and Adams combined for 142 yards on 32 carries. Eagles running back Josh Adams looks to work past Colts defensive back Clayton Geathers during the second quarter. Smallwood, who is the team's No. 4 running back and appeared to be in possible roster peril when Adams was signed off the practice squad last week, had 56 yards on 10 carries, including the game-winning, 4-yard touchdown run. Smallwood was a key on both of the Eagles' two long touchdown drives, rushing for 20 yards on three carries on the first one and 15 on three carries on the second one. The Eagles had a season-high 10 rushing first downs, including four by Smallwood. With three of the Eagles' top four wide receivers out with injuries, Doug Pederson went largely with two- and three-tight-end personnel groupings against the Colts. Unofficially, the Eagles, who had used three-wide-receiver sets on 61.2 percent of their offensive plays in the first two games, used them Sunday on only 19 of 77 plays, or 24.7 percent, including just six times in the second half. Rookie Dallas Goedert, who played just 34 snaps in the first two games and had one reception, played 55 snaps against the Colts, catching seven passes on seven targets for 73 yards and a touchdown. He caught a 13-yard scoring pass from Wentz on the Eagles' first possession out of a "13'' personnel grouping in which he lined up inline and was wide-open in the end zone. Zach Ertz, who had 16 catches in the first two games but was averaging just 8.9 yards per catch, had five catches against the Colts for 73 yards, including a pivotal 7-yard catch on a third-and-4 on the Eagles' first scoring drive. Wentz had 13 passing first downs. Nine were to his tight ends – four each by Ertz and Goedert and one by Josh Perkins.